The A Place in the Sun Garden Hotel is a highly regarded Palm Springs hotel that owes at least some of its appeal to its unique history. Built in the early 1950s, the hotel’s original role was that of a retreat for the production crew of the classic 1951 film, A Place in the Sun, starring Elizabeth Taylor, Shelley Winters, and Montgomery Cliff. The guest units at A Place in the Sun Garden Hotel come in the form of standard studios and spacious bungalows, all of which have kitchen facilities. The other in-room amenities vary and can include such delights as a walled patio with a private hot tub and a romantic fireplace. Palm trees mix with fragrant gardens and lush lawns on the A Place in the Sun Garden Hotel grounds. Among the hotel’s general features is a softwater saline pool. The pool is complemented by a hot tub and a gazebo. When guests aren’t relaxing in their bungalows or taking advantage of the pool, they can practice their putting on the hotel’s artificial turf putting green. 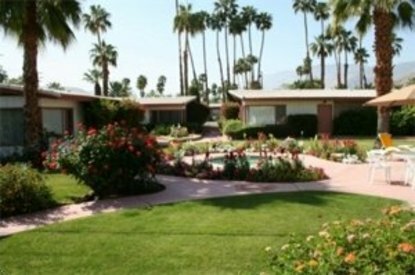 In terms of location, the A Place in the Sun Garden Hotel is situated just south of downtown Palm Springs, which means that all of the great area attractions are within easy reach.